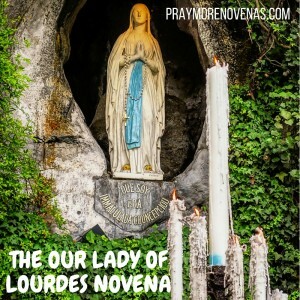 Here’s Day 1 of the Our Lady of Lourdes Novena! Please pray for our daughter to receive a proper diagnosis and healing for mental illness. Please pray for a miracle. ALS. Health and healing of my granddaughters. Eldest child (son). Prayer for employment or new clients as he has recently started a realtor position. Been unemployed for a couple of years and puts a tremendous strain on his dad for financial dependence every month. Christian wife and 3 little girls and for their continued good health and successful job. Youngest (daughter) thanksful for her new job which she really enjoys. She ended a 6 year relationship with her boyfriend, recently and we are asking our Lord, Jesus Christ to bring the young man that He has created to be her spouse and companion, if it is His will. She is 35 and so desiring a Christian man and future children, but feels pressured with her age. Our Lady of Lourdes pleas hear my prayer and present them before Our Lord Jesus Christ for me. Dear Lady,Please pray for my grandson and my granddaughter who are severely depressed. And also please pray for their parents so they can figure out the best way to help them. Please ask you dear Son, Jesus, to heal them. Thank you, Dear Lady. Please hear my prayers as I. All out to thee. I pray dear lady of Lourdes that you would walk throughout my work place and remove all the evil influences. Remove and and and and Lord Jesus I am praying for your saving grace for our organisation. Dearest Our Lady of Lourdes, pray for us, my husband myself and my daughter, son and daughter in law. Please do pray for my sickness that I will be healed. I trust that i’m healed and sometimes I get doubt. Please do pray for me for that sin. Always trust our Lord Jesus. Thank you. Please help me to completely heal from the terrible cancer treatment. Help my husband to let go of his extreme sensitivity. Help my oldest son to discern the priesthood. Help my 2nd son to always be a part of the Catholic church. Help my 3rd son to have a successful summer internship. Help my 4th son to make the right decision about college. Help my 5th child to reach her developmental milestones. I pray that my brother will get into a certain high school and that my mama will be less stressed and my sister will be nice and loving to all. I also oray that my grandpa will get better and live a lot longer i pray that my grandma also smwill be less stressed and i pray that i will be a better person for all to see. One of the that things i will pray for is all the sick for that Jesus will heal them and make them better thank you. Amen. Mother Mary Mother of God please help me to accept that my late grandma is now one of God’s angels and will forever be her loved ones guardian angel. May her spirit , grandfather and uncle spirits rest in perfect peace . Please help us financially. I pray we are more responsible with money and finances. I am so grateful for the financial blessings that God provides us yet we continue overspending. Please help us and relieve us of the desire for unnecessary spending. Please help. I am praying for a solution. I pray to you to help my family find their way back together in this lifetime.Please hear our prayers. Our Lady of Lourdes, I pray to you to help my family to love one anther. Help me to have financial freedom and free of debts. this I pray have mercy on us. Please hear our prayers. Amen. Holy Mary, Mother of the incarnate Savior of the world, I come to you with petitions for my mother as she cares for my father with his disabilities of aging. The emotional anxiety is wearing her down to tears and she needs your strength to help her through each day. My father does not want an outside caregiver but rather wants just her to help him and his confusion and demands are wearing down her emotional strength. She wants to just be his loving wife. You know, Mother Mary, the strength needed to care for those in need and them love them with your whole heart. Please help your daughter, my mom, to model your loving and caring nature. I pray with my whole heart, in the name of your Son our Savior, Amen. Asking for a covering of prayer for my husband Patrick who he is working through a condition in his throat. Praying for perfect healing and recovery. In Jesus name we pray, amen. Thank you. I pray that my granddaughter and her husband will have a healthy baby. Dear Our Lady of Lourdes & St Bernadette. and always be clean of cancer. Help me to pass my IELTS on March 1-2, 2019.. i hope i could achieve higher than the requirements needed for my application in NMCI. Hoping to pass my employer’s interview this Feb 4, 2019.. Please help me, to achieve my dreams this year. Holy Mother help David and Trevor as they battle cancer and give Geraldine and Mavis strength. In the name of the father.Amen. Please help and intercede to save our marriage. Help our hearts heal and our love strengthen. Please help restore my family and help my children with all the pain they have endured during our separation. Hail Mary pray my nephew and his wife will actively return to the Catholic Church, with a stronger faith and dedication than ever. Bless them with a beautiful healthy, normal, strong child who will grow to love you; conceived easily, with a smooth pregnancy; safe, quick, and uncomplicated delivery. Keep them both safe, healthy and happy. Hail Mary pray for Jerry and me to find the right contractor, at the right time and the right for our new addition to our home. Hail Mary Full of Grace, the Lord is with Thee. Blessed are thou Among Women and Blessed is the Fruit of thy Womb Jesus. Holy Mary Mother of God, PRAY FOR US SINNERS, now and at the hour of our death. DEAR ST BERNADETTE PLEASE INTERCEDE TO OUR HOLY MOTHER AND OUR SAVIOR JESUS CHRIST FOR JONATHAN H TO PHYSICALLY CONTACT RIMPY S IMMEDIATELY SO HE CAN BEGIN DATING HER AND BEGIN HIS LIFE WITH HER AS HER TRUE AND FAITHFUL LOVING BOYFRIEND/BEST FRIEND AND HER FUTURE HUSBAND IN JESUS NAME. WE LOVE AND TRUST YOU. THANK YOU, AMEN!